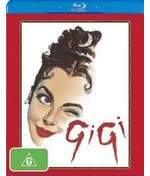 Right on the heels of An American in Paris comes Gigi on Blu-ray that has been remastered for this definitive movie format. Considered the last great musical of the Golden Age of Hollywood, Gigi is once again directed by Vincente Minnelli and unlike his previous movie "set" in Paris, this movie is actually filmed in the City of Love. The most impressive feature of this movie for a film that is over 50 years old is the quality of the transfer and restoration which looks simply stunning on Blu-ray with a beautiful colour palette, sharp images and a decent soundtrack. The story of Giga of course revolves around Giga (Leslie Caron) who is the granddaughter of Madame Alvarez (Hermoine Gingold), a retired courtesan that sends her to her aunt to be taught how to act like a lady. Madame Alvarez is also playing matchmaker and attempts to hook up Gigi with Gaston (Louis Jordan). Unfortunately for Gigi, Gaston has been brainwashed by his uncle Honoré (Maurice Chevalier) that marriages are doomed and only a mistress will do. From there, he decides to vacation in Paris and invites Giga and her grandmother along as the two become embroiled in this quirky and confused romance. Gaston tries to convince Gigi to become his mistress, however she declines and she vows to find true love. Of course where the movie does come into play besides the cute romance are the songs and dance that features some great memorable songs like "Thank Heaven for Little Girls" which although was quite innocent in its day, might come across a little different these days, especially when Uncle Honoré is singing. Needless to say, Leslie Caron is the star of this musical romance that is set in authentic Paris and makes it difficult for viewers not to drawn in from the sights and sounds of this wondrous city. As mentioned earlier, the video and audio quality of this presentation is outstanding and looks amazing on Blu-ray that goes hand in hand with the musical soundtrack. There is even some interesting extras that include commentary by film historian Jeanine Basinger and even Leslie Caron plus a variety of other pleasant extras that neatly puts a bow on this impressive presentation.